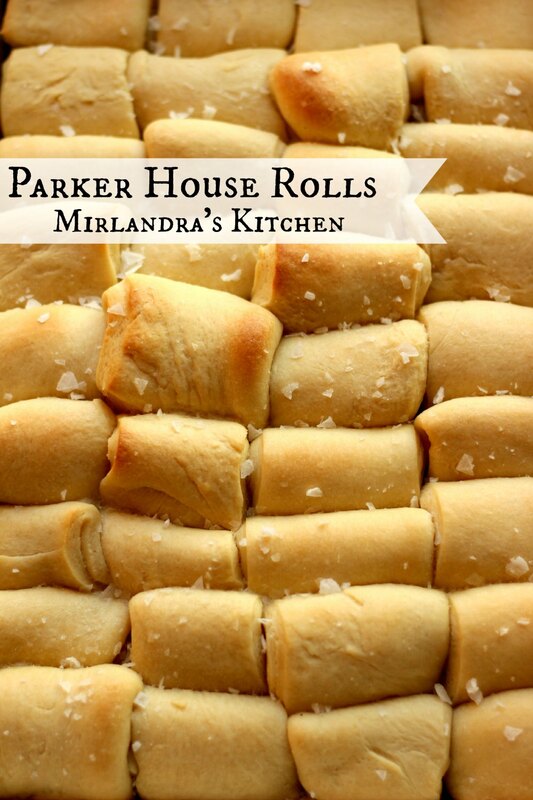 These Parker House Rolls are easier that you might think and have a wonderful buttery flavor. They can be made in advance and baked right before dinner. I’m pretty nuts about fresh baked bread. But then again, who isn’t? Parker House Rolls are a classic in the bread world and date back to the 1870s where they originated in the Parker House Hotel. The story goes that a pastry cook got angry, threw unfinished rolls in the oven, and everybody loved the result even though it looked unusual. Why don’t my fits of temper turn out that well? 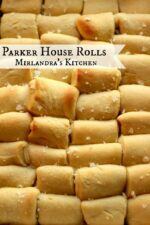 In the past, I have shied away from recipes for Parker House Rolls because the steps appeared complicated. This year I decided to tackle the classic version from The Fannie Farmer Baking Book, 1984. I was born in 1984 so it seemed like fate! Fannie Farmer is of course a classic but I did find some of the directions a bit difficult. To fix that problem I liberally rewrote the directions and made some simple changes to update the recipe for today’s cooks. One genius thing about these delicious gems is that the dough must chill after it is formed. It can do so for up to six hours!!!!! This means you can make them early on in the day and leave them in the refrigerator until about 30 minutes before dinner. If you are roasting a turkey it needs to rest for 30 minutes before you carve it so these fit into the timing for Thanksgiving perfectly! It’s like they were made for turkey day! The leftovers (if you are lucky enough to have some) will really jazz up your sandwiches. Full disclosure: I am not into perfectly formed dough. The photo I included is of the second time I made these rolls ever and I think it looks wonderful! 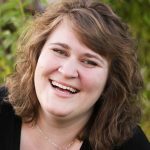 This won’t be a Pinterest Fail for you! These traditional rolls are easier that you might think and have a wonderful buttery flavor with just a hint of sweetness. They can be made in advance and baked right before dinner. In a large, microwave safe bowl: heat milk, water, and butter in the microwave for 30-60 seconds just until it is pleasantly warm to your finger. Whisk in sugar, salt, and yeast. Some lumps of butter will remain. Whisk in 1/2 cup of flour and the egg. 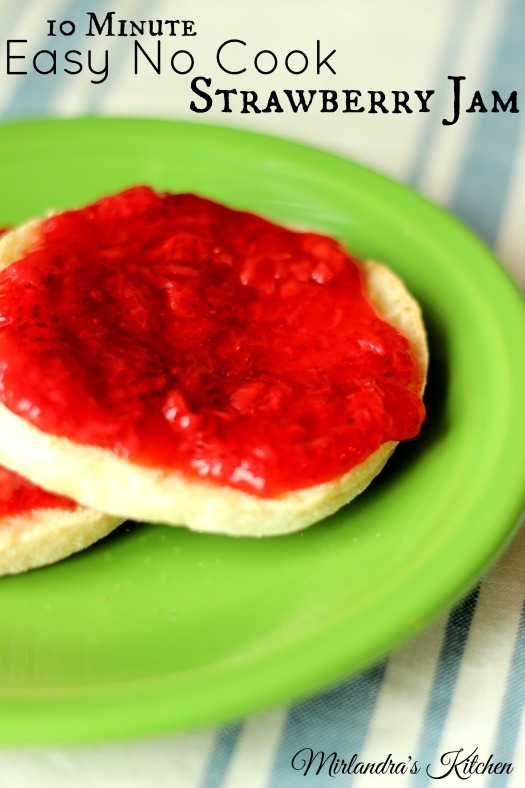 Use a wooden spoon to stir in the remaining 3 cups of flour until a dough forms. Spray a large wooden board and your hands liberally with canola cooking oil spray. Place a damp rag between the board and the counter to keep the board from moving around. Knead the dough on the greased board for 5 minutes. Set the board aside to use again for rolling the dough out. Form the dough into a ball and place in a oiled mixing bowl. Turn dough to coat and cover loosely with plastic wrap. Set the bowl in a warm place until the dough has doubled, about 90 minutes. Melt the 1/2 cup butter and brush some into a 13x9 baking dish. 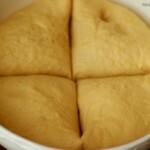 Punch down the dough and divide into 4 equal pieces. Spray the cutting board with canola spray again. Working with 1 piece at a time, roll each piece into a 12"x6" rectangle. It helps to have a ruler handy and measure as you go instead of eyeballing. Cut the rectangle lengthwise into three strips. Each should be 2" wide. 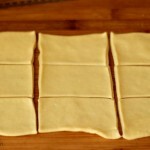 Cut each strip across so that you have a total of 9 pieces of dough, each the size of a 4x2" rectangle. Brush half of each rectangle with melted butter and fold over with the butter side in. Lay the rolls into the pan overlapping a bit like roof shingles. Put 4 across and 9 down the length of the pan. Cover loosely with plastic wrap and chill for 30 minutes or up to 6 hours. 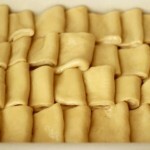 Preheat the oven to 350 and bake the rolls until they are a deep golden color on top, 25-30 minutes. Brush cooked rolls with butter again and sprinkle on a bit of sea salt if desired. Serve warm. The salt is yummy if you eat all the rolls the day off. It makes leftovers a bit strange because the salt soaks into the bread a little and makes white spots. I used a lot of salt in the photo because it was so fun to sprinkle it on! I would recommend about half as much, but it is a personal taste choice.